An exercise bike is one of the most popular pieces of at-home exercise equipment, and when you look at the many benefits it brings, it not hard to see why. Cycling is a highly effective form of aerobic, cardiovascular exercise, which burns through your calories, yet is easy on your joints. Unlike cycling a regular bike, when using an indoor exercise bike, you can sit in a more upright position, relieving pressure on your back and even multitask. 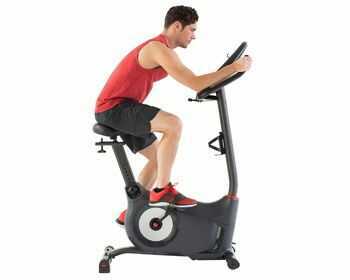 There are two main types of exercise bike – upright and recumbent. They both have many benefits, but it is important you have a clear understanding of which one is right for you before you spend money on one. 1 Back To Basics: What Are The Differences? 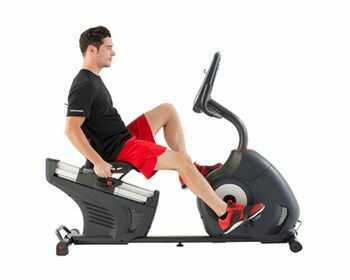 2 Which Muscle Groups Are Worked on Recumbent vs Upright Bike? Back To Basics: What Are The Differences? An upright exercise is most like a regular road bike. You sit in an upright position, although you can lean forward onto the handlebars. The pedals are below your center of gravity, meaning that you can stand up to pedal if you want to give your legs a more vigorous workout or to vary your training. A recumbent exercise bike sits you in a comfortable reclined position. You will pedal with your legs out in front of you, as you lean back in the comfortable seat. You will find that the reclined you sit in on a recumbent bike is very supportive for you back and puts less strain on your arms. In a workout of the same intensity, you should burn fewer calories on a recumbent bike. However, if you are considering a recumbent exercise bike because comfort is very important to you, then it is worth bearing in mind that being in a more comfortable workout position may mean you workout for longer, burning more calories and reaching your targets quicker. Which Muscle Groups Are Worked on Recumbent vs Upright Bike? Whichever type of exercise bike you choose, you will get an effective workout that targets multiple groups. You can also work your abs and obliques, but only if you actively engage them in your workout. Make sure you keep your body upright and tighten your core muscles. If you would like to work more of your upper body while you cycle, you can use some hand weights to do some arm exercises as you pedal, but make sure you and the bike are completely balanced and keep your optimum posture throughout. The main focus of your activity will come from your quadriceps and hamstrings, given that your quads are working to push the pedal down, you are working your hamstrings on the way back up. It is likely that you are working your lower leg more than you realize. You can work your calves even harder if you point your toes during the upward stroke. Due to the reclined position you will likely be sat in on a recumbent bike, you are unlikely to work your abs, unless you sit forwards. Similar to an upright exercise bike you can engage more of your upper body by lifting some hand weights while you pedal. You are much more balanced to be able to do this on a recumbent bike than you are an upright bike. You will be able to lose weight successfully by using both a recumbent bike and an upright bike. As mentioned earlier, you can burn slightly fewer calories on a recumbent bike, but your workouts may be longer, so it doesn’t matter which one you choose – you can pick whichever you think you will enjoy using more. Eat healthily – this means cutting down on carb, fats and sugars, and increasing your intake of high protein, high fiber Try to stick to a healthy, balanced diet. However, it also means having a healthy routine for your food. Eating at regular times will help to reduce your need to snack and help your digestion. Drink plenty of water – according to the Institute of Medicine; you should drink at least 104 fluid ounces (3 liters) of water a day. That’s about 13 cups, but you should increase your intake, even more, when you should exercise. Slow and steady exercise is fine – don’t be discouraged if you can’t reach those higher levels of resistance for more then a few seconds when you first get your exercise bike. Start at the lower levels and work up as your stamina improves. Make sure that your bike is level. Most will have levelers on the frame to ensure that the bike is stable. You can buy mats to put under your bike which can help even out any slight irregularities in the floor. Leave enough room around your bike so that you don’t catch on anything as you are pedaling. You also need adequate room to get on and off your bike safely – without having to twist around any other items. Make sure you put enough thought into how the bike is set up – the height of the handlebars and the height of the saddle – make sure you are in the optimum position for cycling, so you don’t strain yourself. Try and get into a routine that you will stick to. Have a plan that will challenge you and that you can realistically fit into your lifestyle. It’s better to underestimate what you are going to do and surpass it, that overestimate and become disheartened. We have compared the best exercise bikes on the market, you can read our review here. Thank you for sharing. This really helped me choose my recumbent exercise bike. I am 5 feet tall. I need a recumbent bike that my legs can reach the pedals comfortably. Would like one that I can actually easily get on the seat (say seat is 18-22 inches from the floor) preferably, but I know that may not be possible as they don’t seem to consider that. I would prefer more of the slightly bucket styled seat, because I am overweight and the small sit-on instead of sit-in seat is painful.